Published: Aug. 27, 2018 at 11:41 a.m. It was the "dress rehearsal" week in the NFL preseason. But even if a lot of the league's understudies were playing larger roles this week, there was still plenty to be learned from the third week of the preseason. Even if some of the names you had your eye on were living Todd Gurley's dream, there were a number of other names that could end up as excellent depth options on your fantasy football rosters. If you're looking for offense, there wasn't much to speak of. The Browns are happy to get through it with Tyrod Taylor and Baker Mayfield both healthy. Nick Chubb got plenty of work but isn't likely to supplant Carlos Hyde atop the depth chart. Nick Foles had a rough day, which isn't encouraging if the Eagles have to start the season with Carson Wentz on the PUP list. Adrian Peterson has thrown his name into the ring as a contender to get touches in the Washington backfield. How exactly this will work with Chris Thompson, Samaje Perine and Rob Kelley remains to be seen. Emmanuel Sanders continues to shine in what's looking like a bouce-back season. Royce Freeman has taken command of the job in the Broncos backfield. Eli Manning didn't throw a touchdown but got plenty of work and looked solid. We were also reminded of Sterling Shepard's presence and what he brings to the passing game. Sam Darnold put a lock on the Week 1 starting quarterback job while Teddy Bridgewater has made himself a wanted man for anyone looking for quarterback help. Bilal Powell got the start and planted a flag for more carries during the regular season. The Panthers seem intent on convincing us that Christian McCaffrey can handle 25-30 touches per game. So far, the second-year runner has done well with his preseason opportunities. Cam Newton's performance was secondary to his health after he suffered a violent hit while scrambling. In the Patriots never-ending backfield backup battle, Mike Gillislee outshined Jeremy Hill. The search for consistency at wide receiver continued -- leading Eric Decker to subsequently announce his retirement. If this game was any indication, we could see plenty of Kirk Cousins to Stefon Diggs. It was also encouraging to see Laquon Treadwell make plays in a make-or-break year for him. If you didn't believe that Chris Carson is the back to have in Seattle, this should have sealed it ... even if you don't totally believe in the Seahawks offense. In the round-and-round saga of the Lions running back rotation, it was LeGarrette Blount taking the lead, though Kerryon Johnson did find some success. This will not be a fun backfield to figure out. Ronald Jones did have a nice catch on a long throw but Peyton Barber is still slated to be the Bucs lead back. Chris Godwin continued to impress with three more catches, including a touchdown. Derek Carr and Amari Cooper connected on a long throw. It was encouraging but don't start believing the Raiders are a vertical passing game just yet. Chris Warren III has an uphill battle to seeing significant touches in the Raiders offense but he's shown that he is capable if given the opportunity. Aaron Jones looked average in his first preseason action. It will be interesting to see if he sees the field next week as he continues to work into game shape before serving his suspension. The Bears didn't show much with Chase Daniel getting the start. However, Kevin White finally found the end zone. It didn't matter that it was preseason. Just seeing the oft-injured wideout making plays is reason for hope. Patrick Mahomes didn't make any jaw-dropping throws this week but he also avoided any big mistakes and showed the consistency that the Chiefs (and fantasy fans) hope to get from him weekly. James Conner didn't do much as a runner but had a good night catching passes. JuJu Smith-Schuster continued his strong preseason and looks ready for big things in 2018. It was a rough day for Marcus Mariota, and by extension, the Titans offense. This was a reminder that the quarterback's hoped-for breakout could have a ripple effect on the rest of Tennessee's skill position players. Watching John Kelly in these games makes you sad that he's going to be stuck behind Todd Gurley. If you're into handcuffing your fantasy running backs, Kelly is a name to know. Beyond that, Sean McVay hasn't shown much of his hand this preseason. It wasn't a great outing from Deshaun Watson. Alfred Blue is strictly a backup to Lamar Miller but he made the most of his chance this week. In a crowded, confusing backfield, Jordan Wilkins has become a name to watch -- especially if Marlon Mack isn't ready to go for Week 1. Andrew Luck connected with Eric Ebron multiple times, leaving one to wonder if there aren't two usable tight ends in Indy. Jimmy Garoppolo looked a little better, getting both Marquise Goodwin and Pierre Garcon involved. Alfred Morris ran well in extensive work, though he's not likely to see that level of usage in the regular season. Losing Marqise Lee to a knee injury could be a blow to the Jaguars offense. We'll see if they really have added depth to the wide receiver position. Leonard Fournette is going to be just fine if Jacksonville wants to lean on the run. Tevin Coleman is locked in as an alternative to Devonta Freeman for anyone deciding to go with a Zero RB draft strategy. Lamar Jackson finally showed signs that he was putting things together. Although the super-slim chance he had of taking the starting job had long since passed. The Ravens didn't offer much in the way of clarity -- you could say most of the mystery has been solved -- although second-year wideout Tim White showed well. Kenyan Drake tried to end any talk of a timeshare with Frank Gore, thought it seems as though it will be his lot in life nonetheless. Both Alvin Kamara and Mark Ingram got their fair share of work but the more interesting battle was for the team's third running back spot. Boston Scott outshined Jonathan Williams over the weekend but this competition is likely to have one final leg in the preseason finale. Austin Ekeler saw a big role with Melvin Gordon sitting out. The second-year back could have deep sleeper potential as a handcuff. Andy Dalton appears locked in for the start of the season, leading the Bengals on several successful drives. We also experienced more of the John Ross rollercoaster, though it appears that the speedy receiver is figuring things out. It won't matter who the Bills put at quarterback this season if their offensive line can't protect better than they did on Sunday. It's potentially one more reason to fade LeSean McCoy in 2018. Chase Edmonds staked his claim to be the Cardinals' No. 2 running back, though how much work he'll see behind David Johnson is a mystery. Arizona's defense could be a problem for the opposition this year ... or maybe it's the Cowboys offense with the problem. Eight turnovers will do that. There's nothing much to say about Dallas' offense besides it looked awful. True, none of the starters played because of offensive line concerns ... which is a big concern. 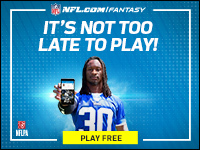 Marcas Grant is a fantasy editor for NFL.com and a man who wonders wishes he could stop time for a few hours. Mostly to take a nap and play some Madden. Send him your supernatural wishes via Twitter @MarcasG. If you read all of that, congrats. Follow him on Facebook, Instagram and Snapchat (marcasg9).